Margot Shoemaker, co-chair of the Social Justice Committee at the church, explained why the church decided to put up the display. 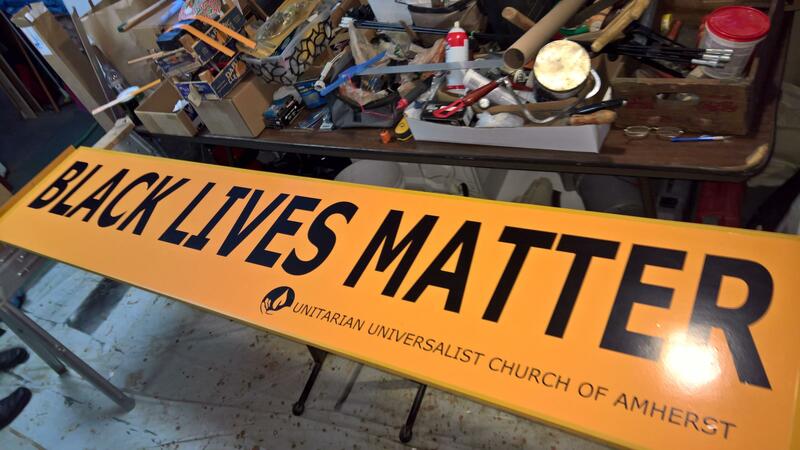 A large "Black Lives Matter" sign is going up in front of the Unitarian Universalist Church of Amherst on Main Street in Williamsville Sunday morning. "There is inequality that exists and the way some people are treated in this country and we feel it’s very important to bring that to the forefront and have people keep acting and demonstrating until some changes are made," Shoemaker told WBFO. Shoemaker said the church wants to show its support for the movement and ongoing dialogue on racial justice issues. Throughout the year, the church offers programming on such issues. She admits she is curious about what effect the sign may have. "We don’t know what to expect. We have talked about it. It was a congregational vote that decided to do this and that was obviously discussed during it. But we feel that we have to go ahead with this, anyway," she added. "A lot of people will see it and think about it and make their decision about where they stand on the issues." The church says the sign will be easily visible to traffic going both east and westbound on Main Street. The unveiling was held at 11:30 a.m. Sunday after a special worship service.